Warning: Rule out cervical spine fracture or subluxation on trauma patient before attempting this projection. Advanced bony pathology of the inner temporal bone structures (skull base) and basal skull fracture are demonstrated. 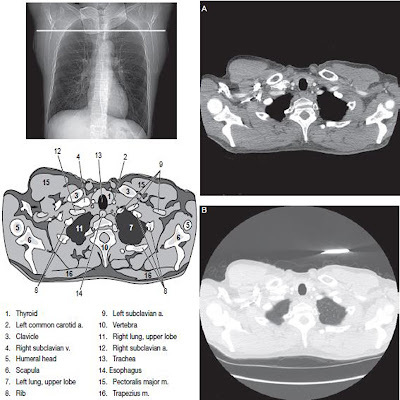 Shield patient's upper thorax region (shielding neck and thyroid will obscure area of interest). Remove all metal, plastic, and other removable objects from patient's head. Take radiograph with patient in the erect or supine position. The erect position, which is easier for the patient, may be done with an erect table or an upright Bucky. A wheelchair can also be used in performing this projection. A wheelchair offers support for the back and provides greater stability in maintaining the position. 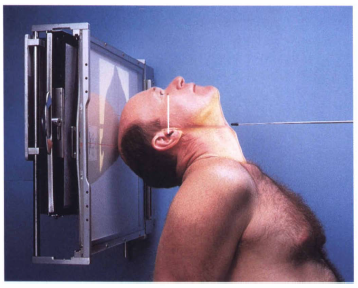 Raise patient's chin and hyperextend the neck if possible until IOML is parallel to IR. see note. Rest patient's head on vertex. Align midsagittal plane perpendicular to the midline of the grid or table / bucky surface, thus avoiding tilt and /or rotation. 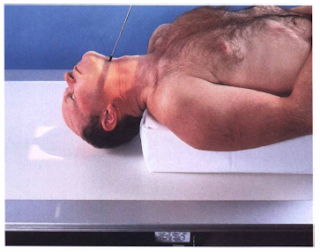 Supine: With patient in the supine position, extend position, extend patient's head over end of table, and support grid cassette and head as shown, keeping IOML parallel to IR and perpendicular to CR. If table will not tilt, use a pillow under patient's back to allow sufficient neck extension. This position is very uncomfortable for the patients in the erect or the supine position; perform it as quickly as possible. CR is perpendicular to infraorbitalmeatal line. Center 1 1/2 inch (4 cm) inferior to the mandibular symphysis or midway between the gonions. Collimate to outer margins of skull. 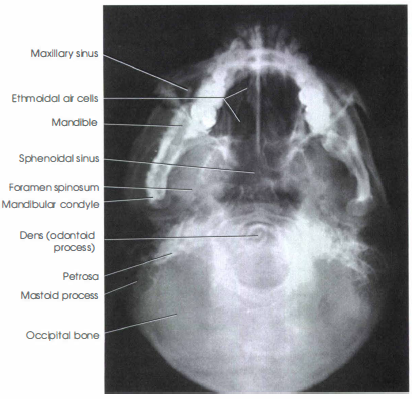 Foramen ovale and spinosum, mandible, spenoid and posterior ethmoid sinuses, mastoid processes, petrous ridges, hard palate, foramen magnum, and occipital bone are shown. Correct extension of neck and relationship between IOML and CR as indicated by mandibular condyles projected anterior to petrous pyramids and frontal bone and mandibular symphysis superimposed. Mandibular condyles should be parallel to each other as evidenced by no rotation or tilt, as also indicated by equal distance bilaterally from mandibular condyles to lateral border of skull. Entire skull should be visualized on the image, with the foramen magnum in the approximate center. Collimation borders should be visible on outer margins of skull. Density and contrast are sufficient to clearly visualize outline of foramen magnum.